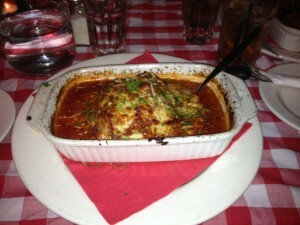 We were first introduced to Elios by our good friends Adrian and Janet, both of whom are big fans of the lasagne. Even after living in England for a few years, they say they have not had a better lasagne. It took a couple of trips to Elios before we tried it ourselves. Not because we didn’t believe it was that good but because there were so many other great dishes to tempt us. When we did try it, we agreed it’s brilliant. The lasagne has a rich bolognese sauce with beautiful fresh pasta layers topped in melted cheese. 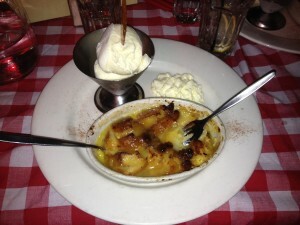 When it comes time for desert, the standout for us is their bread and butter pudding. Nothing like the bread and butter puddings of old, theirs has a wonderful blend of caramel and apple with pieces of bread that are more akin to donuts than your morning toast. It’s to die for. To top off the wonderful food the services is fun and friendly, creating a warm and inviting atmosphere. They seem to take pride in being a bit quirky. You just have to look at the sign at the counter – “Used Ferraris and Gold Bullion Accepted” – to see this. If all this sounds tempting, book yourself a table. Just remember to leave room for desert. This entry was posted in Food & Coffee. Bookmark the permalink.